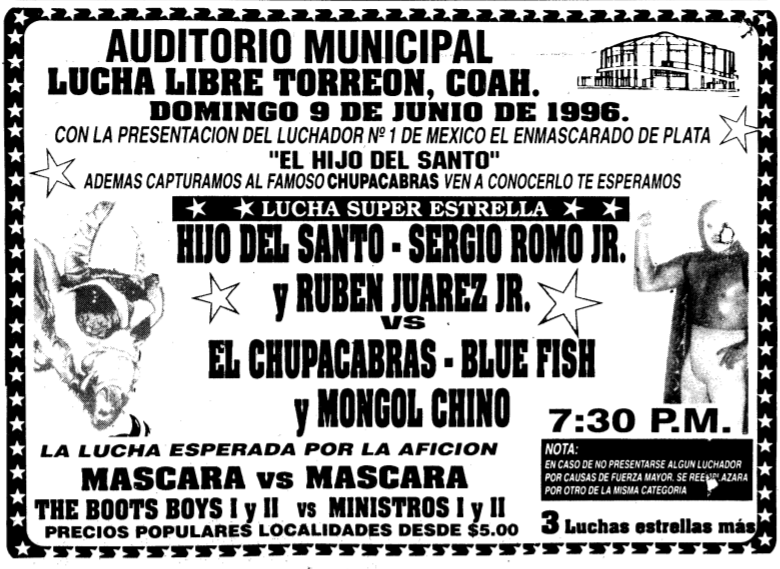 Event Notes: not really a lucha libre show, but wanted to include a link to Santo & Casas. 3) Bello Galan, Golden Rubi, Orquídea Negra vs Apóstol Jr. II, Baby Lover, Stuka Jr.
****. Elimination. Came down to Psicosis vs Rey Misterio Jr. for eight minutes. Stuka Jr. return from injury? 4) Power Ranger I, Power Ranger II, Power Ranger III vs Gran Jefe I, Gran Jefe II, Gran Jefe Jr.
Thunderbird was declared too light by the commission to be in the tournament, so they had an impromptu match with him anyway and tried to make it a title chagne. Commision said no to that too. Angel Mensajero was also supposed to be in the tournament, but was hiding from police due to a stabbing incident. 4) Cien Caras, Frankenstein, Pierroth Jr. b Máscara Sagrada Jr., Sicodelico, Tinieblas Jr.
4) Simbad El Marino & Snake vs Gran Jefe I & Gran Jefe Jr.
5) Konnan, La Parka, Máscara Sagrada (Alebrije) b Heavy Metal, Jerry Estrada, Pierroth Jr.
5) Star I & Star II vs Centella Azul I & Centella Azul Jr.